When it comes to testing accuracy and speed, the ProCon 6 is without peer. In a real world environment of 24-hour-a-day production, the ProCon 6 consistently maintains a throughput of 365 mandrels a minute and a loading efficiency of 88%. We guarantee this machine will perform at a .015 Acceptance Quality Level (AQL), which is far and away the best in the business, exceeding ASTM, ISO/FDA, and WHO standards. 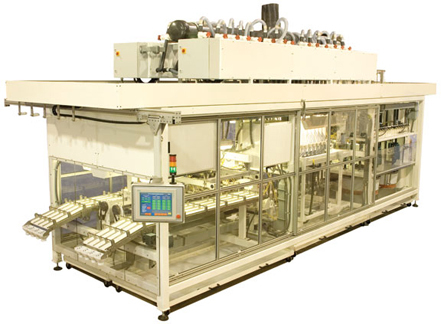 The ProCon 6 has all of the “tried and true” features and production efficiencies that we’ve developed, perfected and incorporated into our industry-acclaimed condom testing machines since 1992. And many ground-breaking new features. Our patented “test tunnel” and “fail roll tower” are the two most important advances in condom testing in the last decade. The ProCon 6.... In the world of condom production and testing it’s in a world of its own.